Machoke is a Fighting type Pokémon introduced in Generation 1. It is known as the Superpower Pokémon . The effectiveness of each type on Machoke. In Generation 3, Machoke does not have the No Guard ability. In Generation 1, Machoke has a base Special stat of 50. In Generations 1-4, Machoke has a base experience yield of 146. 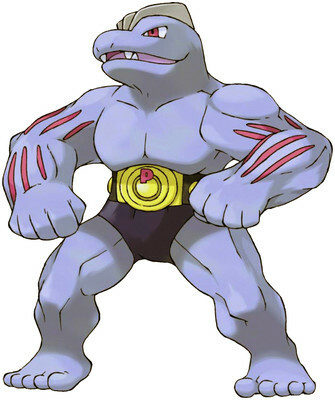 MACHOKE’s thoroughly toned muscles possess the hardness of steel. This POKéMON has so much strength, it can easily hold aloft a sumo wrestler on just one finger. When it encounters an enemy that’s truly mighty, this Pokémon removes the power-save belt from its waist and unleashes its full power. Machoke learns the following moves in Pokémon Let's Go Pikachu & Let's Go Eevee at the levels specified. Machoke learns the following moves in Pokémon Ultra Sun & Ultra Moon at the levels specified. Machoke learns the following moves via breeding in Pokémon Ultra Sun & Ultra Moon. Details and compatible parents can be found on the Machoke egg moves page. Machoke can only learn these moves in previous generations. It must be taught the moves in the appropriate game and then transferred to Pokémon Ultra Sun & Ultra Moon.